During a 30-year career as a geologist, Jacques Goldstyn whiled away his spare time drawing comics for children’s science magazines. Since then he has written and illustrated numerous books in his native French, including the 2015 title L’Arbragan (Éditions de la Pastèque), which won the 2016 Prix TD de littérature canadienne pour l’enfance et la jeunesse, the top French-language prize at the TD Canadian Children’s Literature Awards. 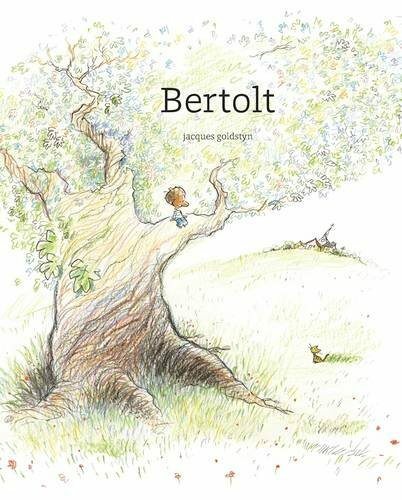 This spring, an English translation of that book, rechristened Bertolt (after German poet and playwright Bertolt Brecht), is out with Brooklyn, New York–based indie publisher Enchanted Lion Books. A tiny, spritely protagonist with a hot dog-shaped nose and acorn toque races around a world rendered in delicate ink drawing, soft pencil texture, and the occasional wash of watercolour. Careful details add up to an evocative feeling of Montreal, with its specific outdoor staircases, snowy churches, and hockey on a tiny television next to a Habs poster. The story doesn’t have much of a plot, but is a rich and meandering character study of a boy who enjoys solitude, particularly in the branches of his favourite giant oak, which he calls Bertolt. Nestled in Bertolt’s mighty, 500-year-old branches, the boy finds immense satisfaction in observing the flora and playing with the fauna, and watching the movements of the townspeople from his hidden vantage point high above. But when spring comes and Bertolt’s branches fail to bloom, our hero must find a way to honour the loss. The book was written over the course of the illness that led to the death of the author’s mother. Goldstyn’s grief leaks out over the volume’s 80 pages. Rather than suffocate the story, it opens a window wide to the value of ritual and the solace of creativity. It is an intimate book that implores you to read it in hushed tones with quiet pauses. Its sadness holds beauty; its sweetness never threatens to become saccharine. Bertolt is a truly exceptional exploration of ephemerality.